TO CHEW ON: "But Gehazi, the servant of Elisha, the man of God, said, 'Look, my master has spared Naaman this Syrian, while not receiving from his hands what he brought; but as the Lord lives, I will run after him and take something from him.' " 2 Kings 5:20. The last character in the Naaman story is Gehazi, Elisha's servant. He isn't confronted with the circumstance Naaman's leprosy, as the characters in the earlier installment were, but with his boss's reaction to Naaman's offer of gifts. I can just see Gehazi as Naaman returns to Elisha, loitering in the background, his eyes glittering as Naaman's servants unpack the beautiful clothes and the sacks of coin. Then watch his expression change when Elisha refuses them all. He wants that stuff, oh, how he wants it! And so he concocts a plan. 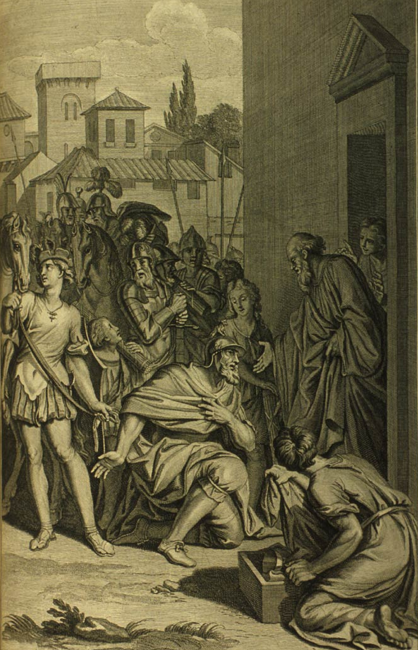 He runs after Naaman and tells him that Elisha has received guests, now needs some things, and asks for a modest two outfits and a sack of silver. After stashing them safely in his quarters he stands before Elisha as usual to wait on him. In answer to Elisha's, "Where did you go, Gehazi?" he replies with the brazen, "Your servant did not go anywhere." Foolish Gehazi. Do you not know that your master is in touch with the One who can not only see your motives and actions, but can reveal them to him? Elisha confronts Gehazi with what he has done and bequeaths him and his family with the leprosy that had infected Naaman. What can we learn from how this sly prophet's assistant handled his test? Three things come to mind. 1. Exposure to the things of God and the people of God doesn't change our hearts. Gehazi served the man of God but he wasn't a godly man. Each of us needs to come to God personally and have a personal relationship with Him. 2. God has a way of revealing knowledge about people and situations to those who are close to Him. 3. Like Gehazi's response to Naaman's beautiful stuff revealed his covetousness, greed, deceit, and sneakiness, so our response to temptation can show us what's inside us. Let's observe our responses to today's circumstances and the temptations they bring. Then let's allow these tests to educate us about ourselves, our weaknesses, and our need for repentance and a change of heart. PRAYER: Dear God, please help me not to kid myself that I can fool You in any way. I pray with the psalm writer: "Search me O God, and know my heart. Try me and know my anxieties. And see if there is any wicked way in me. And lead me in the way everlasting" (Psalm 139:23-24). This story reminds me of one from the New Testament. The couple Ananias and Sapphira gave a generous gift to the early church but in a deceptive way. Read what happened to them in Acts 5:1-11.